During my recent visit to Los Angeles, I had the opportunity to visit Griffith Observatory not far above the hills of Hollywood. This observatory came about because of a dream of one man, Griffith J. Griffith. Yes, his first and last names were the same. He made his fortune in silver mines and real estate in the late 1800's. He purchased this hilltop land for his home and later decided to donate over 3,000 acres (1,214+ hectares) of it to the city of Los Angeles to build a public park. Later, he donated $100,000 to the city to build an observatory in 1912, but due to many delays, it wasn't completed until 1930 and unfortunately, Griffith never got to see his dream fulfilled when he passed away in 1919. At the entrance is a pillar dedicated to astronomers of the past. One can get a great view from the back exterior of the observatory. I am not quite sure, but those tall buildings in the distance might be the city of Santa Monica covered in gray and rainy skies. One can also get a clear view of the famous Hollywood sign. This is the ceiling of the rotunda right at the entrance. It has many neat exhibits and displays including this one with samples of most of the elements in the Periodic Table. I could have used this in high school chemistry class. This is the new 200-seat Leonard Nimoy Event Horizon Theater. Yes, Spock! His and his wife, Susan's, contribution to the observatory, gave name to this theater. 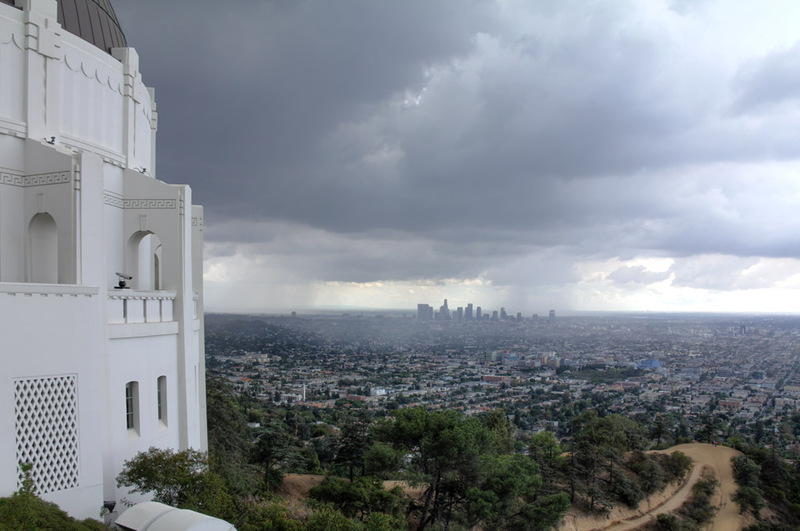 A 20-minute film shown daily called "The Once and Future Griffith Observatory" narrated by Mr. Nimoy should not missed if you ever happened to visit. On display is this full-sized statue of Albert Einstein. During my visit, I swear everyone who passed by wanted a picture with him. If I recall correctly, the reason for his pose states that merely placing a finger inches away from your eyes, you would have covered thousands if not millions of stars in the night sky. There was also a bust of the movie star James Dean. Many movies have been filmed on this land, but the classic 1955 movie "Rebel Without a Cause" starring James Dean was the first one to portray the observatory and contribute positively to the observatory's international reputation. Have you seen a movie that was filmed here? If you are not sure, check out this list. What a spectacular place this is. Views that are quite literally out of this world! What a wonderful place to visit. The inside and the views from the outside are just beautiful. And yes, I have seen movies and TV shows filmed there. Great post, thanks for sharing. It looks very interesting, my favourite is your picture of the pillar. What a great view from the obsavatory! Of course, the inside is very interesting to walk around. I have never been there, and seeing these photos, I wonder why not. You have given me a destination spot to add to a long list, this place is phenomenal. Thank you for introducing it to me. Poor Griffith! His parents really weren't very imaginative, were they? It reminds me of Eric Ericson who chose his own surname to mean "son of himself" when he rejected his own parents. The view from this place is just incredible!!! That third photo is amazing - you should frame it. This looks like an amazing place, I'd definitely like to visit it in person one day. And finally, I am sorry for being so scarce lately. I see it has almost been a full month. I was on holiday in the first week of the month but busy, busy, busy since then. I've begun studying again but I really do need to settle down and take time to read my favourite blogs. I'll catch up with your blog but will try not to spam you with comments! looks like a great place to visit. the pillar looks truly one of a kind.